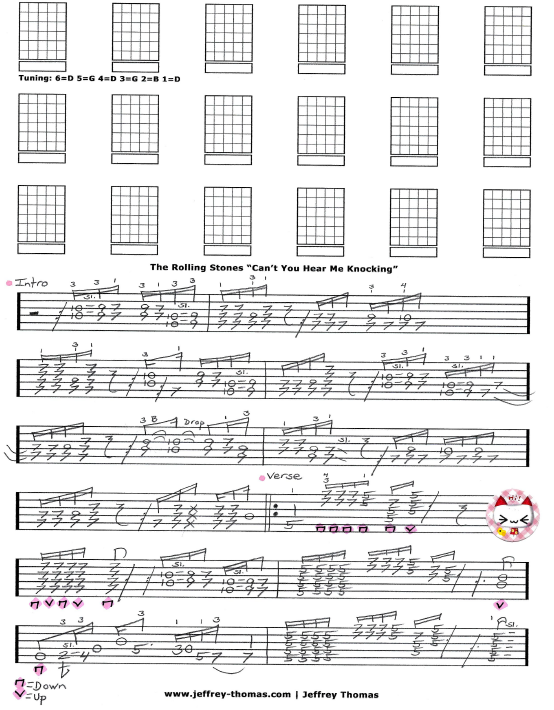 The Rolling Stones Can’t You Hear Me Knocking Free Guitar Tab by Jeffrey Thomas. Thanks for checking out my guitar tab arrangement for this classic rock tune! Learn the proper tuning, song structure, licks, fills and rhythm guitar playing all arranged for one guitar. The solo section has been condensed because of the tuning limitations. Want the full guitar tab for free? Just go ahead and send me your email address through the form provided. Set up your free Skype guitar lesson by completing the Schedule A Free Lesson form. Hope to see you on Skype soon! “Can’t You Hear Me Knocking” is from the album Sticky Fingers released in 1971 and the running time of the song is over 7 minutes! Find more free online guitar tabs on my blog, tab and video pages.